By Metal Sonic. Art by Blue Frog. Teambuilding is the most important aspect of competitive Pokémon and is thus an important skill to have. However, the art of teambuilding might not be intuitive; newer players often just use six powerful Pokémon for their teams, rather than Pokémon that work well together. To illustrate the importance of teambuilding, we can use the analogy of driving. Your team is the car, and you are the driver; a well-made, high-performance car will be much easier to drive than a shoddy one. Having a better team makes winning games easier. This article's purpose is to teach you how to teambuild effectively by taking into account synergy and cores. Synergy - "The interaction or cooperation of two or more organizations, substances, or other agents to produce a combined effect greater than the sum of their separate effects." Synergy, to put it simply, is how well two or more Pokémon work together. This is an essential part of teambuilding, as it separates a well-made team from one consisting of random Pokémon. Teams that lack synergy are prone to having most or all of their team swept or walled by certain Pokémon, as they lack the necessary checks and counters to these threats. On the other hand, having good synergy allows your team to sweep or wall any opposing team with ease. There are two different types of synergy: synergy through typing and synergy through checks and counters. Synergy through typing is when two or more Pokémon are mutually resistant or immune to the other's weaknesses. This allows them to switch back and forth freely without taking much damage. 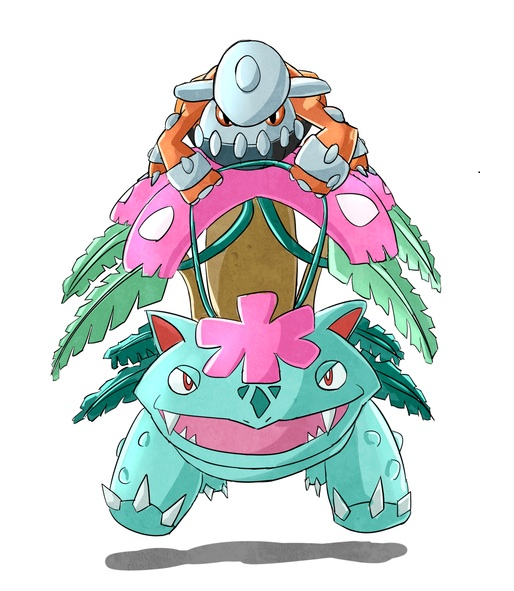 One example of two Pokémon with effective type synergy is Venusaur and Heatran. Venusaur has four weaknesses: Psychic, Flying, Fire, and Ice. Meanwhile, Heatran is immune to Fire and resists the other three. On the other hand, Heatran is weak to Ground, Fighting, and Water. In the same vein, although Venusaur is hit neutrally by Ground, it resists Fighting and Water. This almost perfect type synergy allows them to freely switch back and forth and apply defensive and offensive pressure to the opposing team. Synergy through checks and counters takes a different approach to synergy; instead of each Pokémon covering the other's weaknesses through its typing, check and counter synergy involves twoPokémon that work well together because each can remove the other's specific checks and counters. This type of synergy aims to give let each Pokémon give its teammate an easier time fulfilling its role, whether it's walling or sweeping, by removing the Pokémon that stop it from doing so. The combination of Mega Gyarados and Talonflame is the perfect example of check and counter synergy. While they don't have the best type synergy, each excels in defeating its partner's counters, opening up opportunities for their partner to sweep. Mega Gyarados is a deadly sweeper but is often hindered by the likes of Keldeo, Ferrothorn, and Skarmory. Talonflame can help Mega Gyarados by taking down these Pokémon with its super effective STAB attacks. In the same vein, Talonflame is stopped by its fair share of counters, such as Heatran, Tyranitar, and Hippowdon. Mega Gyarados can assist Talonflame's sweep by destroying these Pokémon. This is an illustration of a great synergetic pair through checks and counters. Cores are groups of two or more Pokémon that have synergy through their typing, through checks and counters, or both. Cores are often self-sufficient and are usually used as the centers of teams that are built around them. In general, there are two types of cores: offensive cores and defensive cores. These types of cores ultimately differ in their playstyle and goals. Offensive cores are focused on quickly eliminating opposing Pokémon with high-powered attacks. The Pokémon in offensive cores aim to remove each other's checks and counters through their offensive type synergy in order to open up sweeping opportunities for their partners. Offensive cores primarily comprise of sweepers or bulky attackers that are usually able to eliminate or set up on each other's threats. In contrast, defensive cores are focused primarily on defensive type synergy. The main goal for these cores is to wear down or halt offensive threats so that the opposing team has trouble dealing any damage whatsoever. Defensive cores mainly consist of walls or very bulky attackers. During teambuilding, it isn't uncommon to accidentally build a great core just by taking into account the aforementioned idea of synergy. However, coming up with a core immediately is more difficult. When building a core, it is not wise to only pick Pokémon that have good type synergy, as it is more important to take into account the common threats in the current metagame and if your core is able to handle most of them. Many new players often only take into account synergy through typing when teambuilding and building cores. While this can sometimes form effective cores, most of the time it is not enough. This is particularly noticeable in offensive cores, as the main objective for these cores is to clear a path for the team's sweepers rather than use defensive tactics and type synergy to neutralize opposing attackers; without checks and counters synergy, offensive cores will fail.. Cores become more effective and much easier to use if they incorporate both types of synergy. A good way to start when building a core is to select one Pokémon and identify its weaknesses and checks and counters. Then, try to find another Pokémon that covers these weaknesses in the best possible manner. Do not forget to take into account the base stats of the two Pokémon. For example, the classic core of Skarmory and Chansey is effective purely because of how well their base stats complement each other: Skarmory is extremely physically bulky, while Chansey is extremely specially bulky. It is also very important to test your core in battles against the ladder or your friends. Often, the first core that you test will look good on paper but in reality isn't that effective. Through practical experimentation, you can identify the core's strengths and weaknesses, and might find a more effective Pokémon to replace one in your core. Finally, it should be noted that these tips are not limited to building cores: they are also useful when one is trying to build a team. This offensively oriented core aims to dismantle opposing walls with both physical and special attacks, letting one partner open up a sweep for the other and end the game as quickly as possible. While this core lacks type synergy, it makes up for it with its excellent checks and counters synergy. Mega Metagross's devastating attacks are not taken easily by many; but those that can, such as Mega Sableye, Skarmory, Mandibuzz, Mega Scizor, and Bisharp, are decimated by Keldeo. Keldeo not only scores at worst a 2HKO on every listed Pokémon but also can set up a Substitute and potentially a sweep against all of them. On the other hand, Keldeo's onslaught is stopped by the likes of Venusaur, Amoonguss, Latios, and Latias, all of which are annihilated by Mega Metagross. Keldeo and Mega Metagross have two different roles in thirs core; Keldeo functions as primarily a special sweeper and thus uses Calm Mind and Substitute, while Mega Metagross functions as a mid- to late-game sweeper and thus uses a multitude of coverage moves. However, if the opposing team is stall-oriented, Mega Metagross can also be used as a wallbreaker that destroys the common Venusaur + Heatran core and opens up a sweep for Keldeo. Even with me going on about how good this core is, there are still threats that you need to look out for. Talonflame is one of the biggest threats to this core, as it can outspeed and OHKO Mega Metagross and Keldeo with a strong Flare Blitz or Brave Bird, respectively. Though it is uncommon, Mega Sceptile can be a pain, as it outspeeds both and can even KO a weakened Mega Metagross. Azumarill can take any attack that Keldeo throws at it while also being able to take hits from Mega Metagross and retaliate in turn. Assault Vest Raikou is a great partner for this core, as it can check or counter all the aforementioned threats, softening them to let the core do its job. Rotom-W is also a good partner, as it can handle all the aforementioned threats bar Mega Sceptile. This core is focused around the deadly sweeper that is Mega Gallade. Gallade's great Attack stat and access to Swords Dance works in tandem with its good Speed tier and decent movepool to deal tons of damage and sweep teams. However, there are still Pokémon that Gallade can't break through, such as Mega Sableye, Mega Slowbro, defensive Landorus-T, and Unaware Clefable. Diggersby only has fair type Synergy with Gallade, taking Ghost-type attacks for it while Gallade can take Fighting-type attacks aimed at Diggersby. However, Swords Dance + Life Orb Diggersby can lure and demolish most of the Pokémon that Gallade fails to beat by itself. Therefore, this core is a prime example of checks and counters synergy; both draw in and wear down each other's checks and counters. If you only have one other thing on a team built around this core, it should be fast revenge killers. This core lacks Speed and is hurt badly by faster offensive Pokémon, such as Talonflame, Mega Lopunny, and Mega Sceptile. There are many fast revenge killers that you can use, such as Choice Scarf Landorus-T. A good option for a defensive partner is Rotom-W, as it has great type synergy with Diggersby and can easily deal with some faster threats, such as Talonflame and Choice Scarf Landorus-T. This unusual-looking core focuses on Mega Gyarados's capabilities late-game sweeping. Mega Gyarados is an excellent late-game sweeper thanks to its great bulk and high Attack, but it does have its fair share of flaws. It is easily walled by the likes of Skarmory, Mandibuzz, and Ferrothorn, along with Chesnaught and Mega Venusuar if lacking Ice Fang and Kyurem-B if lacking Stone Edge. Gothitelle can trap and remove all of the aforementioned threats with Hidden Power Fire, Thunderbolt, or Psychic thanks to its amazing ability in Shadow Tag. Gyarados should not be sent into play until its checks and counters have been removed by Gothitelle. Then, Gyarados can switch into something it can force out, such as Mega Metagross, while possibly setting up two Dragon Dances. If Gothitelle has done its job, there's not much that can stop a boosted Gyarados. Gothitelle might have to be sacrificed after its targets have been eliminated, but if its job has been done, it isn't dead weight. There are a few Pokémon that pose a threat to this core, mainly Conkeldurr and Breloom. Both can revenge kill Gyarados with Mach Punch, while Gothitelle can have trouble switching in because Conkeldurr has Knock Off and Breloom can put it to sleep. These threats can be dealt with by delaying Gyarados's Mega Evolution so that it resists Mach Punch, but the power loss is very noticeable. Talonflame can also pose trouble for a weakened Gyarados because of priority Brave Bird. A Talonflame of your own makes for a great partner to this core thanks to its ability to remove these threats. Meanwhile, Gothitelle greatly appreciates support from Pokémon with U-turn or Volt Switch, which let it have an easier time trapping and eliminating problematic foes. Landorus-T and Rotom-W are good options for this role that can also deal with the above threats to the core. This defensive core utilizes an extreme amount of defensive synergy to fight off the most prominent sweepers in the metagame. As demonstrated above, Mega Venusaur and Heatran have an incredible amount of type synergy. This allows them to fend off huge threats such as Terrakion, Latios, Latias, Mega Sceptile, Talonflame, Mega Lopunny, and Keldeo. Unaware Quagsire rounds off the core by walling and removing powerful setup sweepers such as Bisharp, Mega Charizard X, and Mega Pinsir. It also has great type synergy with both Heatran and Mega Venusaur, allowing the core to handle even more foes, including Mega Metagross and Mega Gallade. However, there are still threats that can break this defensive core, though they are uncommon. Calm Mind Mega Sableye can set up easily thanks to Magic Bounce and Recover off any poison damage that might have been incurred by Sludge Bomb. Quagsire can PP stall it out, although this is not a very efficient method. Mega Heracross can overpower Venusaur with Megahorn and take down Heatran and Quagsire easily with Close Combat and Bullet Seed, respectively. Kyurem-B can bypass Mega Venusaur's Thick Fat thanks to Teravolt and hit it hard with a super effective STAB Ice Beam while hurting Heatran with a 4x super effective Earth Power. A great offensive teammate for this core is Talonflame; although it might not fit in with the defensive nature of this core, it can eat Will-O-Wisps from Mega Sableye and remove Mega Heracross easily. This defensive core takes advantage of the absurdly high defensive stats of Skarmory and Chansey to recreate the famous DPP "SkarmBliss" core. In the modern era, Mega Sableye is needed to counter opposing status users that might threaten SkarmBliss but can be handled by Mega Sableye thanks to its useful ability in Magic Bounce and good bulk. Few unboosted Pokémon can dream of breaking through this core. Mega Lopunny might be able to beat Mega Sableye thanks to Scrappy, but it cannot get past Skarmory unless it is severely weakened. Strong Psyshock users such as Latios and Mega Alakazam can find that Chansey's physical bulk is just as difficult to break through. However, this also means that foes that have successfully set up are extremely dangerous. Swords Dance Bisharp might not enjoy Will-O-Wisp from Mega Sableye, but with a boost or two, it can break the core. Opposing Calm Mind Mega Sableye might not be able to touch Chansey, but Chansey can't do anything back either, leading to a PP war. Calm Mind Keldeo can break through Chansey, and consequently the rest of the core, with Secret Sword after multiple boosts. Therefore, using the core effectively means you need teammates that can identify setup sweepers and prevent them from doing so. Heatran returns again, with its useful typing proving helpful in generating tremendous type synergy for defensive cores. Ferrothorn is a fellow Steel-type that does what Mega Venusaur does, taking Water- and some Ground-type attacks for Heatran. Zapdos here is key: it takes the Fighting- and Ground-type attacks that both Heatran and Ferrothorn hate, while its Ice weakness is covered by Heatran and Rock by Ferrothorn. The core can handle many of the threats in the ORAS OU metagame, such as Mega Scizor, Latios, Latias, Talonflame, and Landorus-T. However, as with all cores, this core is threatened by a multitude of Pokémon. Mega Heracross is problematic, with Skill Link Rock Blast to take on Zapdos and Close Combat to demolish the Steel-types. Ice Punch Mega Gallade breaks through the core with ease. Mega Sceptile can engage Zapdos thanks to Lightning Rod, though it has to watch out for Hidden Power Ice, and can take on Heatran and Ferrothorn with well-aimed Focus Blasts. Kyurem-B survives a Gyro Ball and 2HKOes Ferrothorn with Ice Beam, with Earth Power to eliminate Heatran. While it doesn't fit with the defensive nature of the core, Talonflame can deal with all of these threats nicely with its powerful priority Brave Bird. If you want more cores for teambuilding, check out this thread for a whole collection of great cores for you to use. Due to most cores being self-sufficient, they are often used as the centers of teams and do the most work in battles. However, cores are far from perfect. For example, the core of Venusaur, Heatran, and Quagsire is beaten by the likes of Mega Heracross and Kyurem-B. A helpful teammate such as Talonflame is then added to patch up the core's weaknesses and allow that core to function better. This method of teambuilding around the core allows it to reach its full potential; good teammates are mentioned in the core descriptions above to help you teambuild around them. Smogon and other outside sources have a variety of tools that can help build cores and teams and test synergy. The "Team Options" and "Checks and Counters" sections in Smogon analyses are very helpful for building teams and cores. bReakMyTeam is a great tool to test your team or core for threats. Finally, Marriland's Synergy Calculator is great for testing synergy. Hopefully, after reading this guide, you have gained some knowledge on how to effectively teambuild and learned how the best teambuilders make their teams the best they can be. With this guide, the challenge won't be to teambuild around a certain Pokémon, it will be to choose one. Just remember that even with the endless viability rankings and articles that dictate which Pokémon are effective and which are not, there is also another thing that is endless: your creativity.